Are the machines out to get you? Are they going to replace you and your colleagues? The short answer is "No", but they have the potential to change how you do your job. This primer will enable you to be informed about these changes and proactive in making your job more productive and enjoyable. This presentation will dive into how components of artificial intelligence are being used to create modern conversational support experiences today. Learn about the differences between chatbots and virtual agents, discuss scenarios where virtual agents excel, and how virtual agents can improve key support metrics such as MTTR and customer satisfaction. Discover what's trending in the IT Service Management community on BrightTALK and how you can leverage these insights to drive growth for your company. Learn which topics and technologies are currently top of mind for IT Service Management professionals. In this webinar, we will discuss how self-service can move from a request channel to a fulfillment channel for your end users. With a change in focus to automation, an organization can revolutionize customer experience without adding expensive headcount. We will walk through the challenges of self-service today and talk about the value of automation with a virtual agent that leverages artificial intelligence, machine learning, and natural language processing enable conversational approaches to issue resolution – and create more satisfying and productive service experiences for users. In this era of increasing digital transformation, ITSM needs to adopt a solid, modernized approach to ensure customer satisfaction, information security and operational excellence. ITSM practitioners must embrace new and innovative capabilities, practices and technologies so as to enable better customer service, flexible deployments and robust data protection. These include artificial intelligence, machine learning and process automation. In this panel, moderated by leading ITSM consultant Doug Tedder, our team of experts from Serviceaide, Cognizant, UBM and Virtual Clarity will discuss the journey ITSM is embarking on to ‘see the bigger picture’ in an increasingly digital world. Self-service has been a key component of service desks for a decade but has yet to truly deliver the benefits that organizations were hoping for. Although self-service provides value for help desk teams, customers’ experiences often fall short of being satisfying. In fact, in a recent HDI survey, 71% of organizations say that improving customer experiences is a priority. This webcast discusses how service management teams can enable better experiences by providing conversational approaches to issue resolution using virtual agents. Luma, an innovative virtual agent from Serviceaide, guides users to create actionable tickets, performs knowledge lookups and streamlines tasks such as password resets, amongst other capabilities. Best of all, Luma is available 24x7 to ensure customers get their issues resolved rapidly anywhere, at any time. 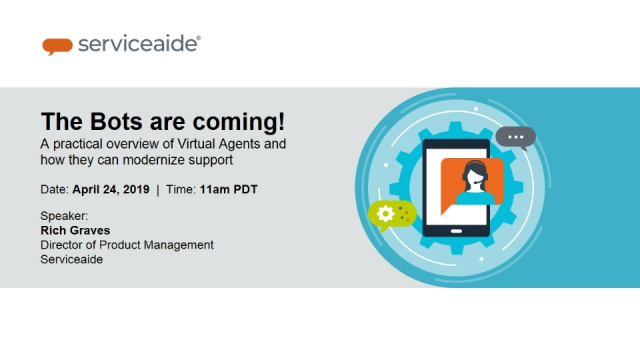 Attend this webcast to see how virtual agents can improve customer self-service experiences. Introducing Luma the Virtual Agent with Artificial Intelligence. Learn how organizations using ITSM software from CA Technologies can rapidly leverage this powerful capability without altering their current implementations. •You will see Luma in action, automating self-service, guiding users to create actionable tickets, performing knowledge lookups, and automating tasks such as reset password. Artificial Intelligence has finally come to IT Service Management in the form of a Virtual Agent that can act as a Level-0 analyst. This webinar will explain how Luma, a virtual agent can perform the duties of a Level-0 technician, freeing organizations from the high cost of manning a help desk and providing round-the-clock support. You will see Luma in action, automating self-service, guiding users to create actionable tickets, performing knowledge lookups, and automating tasks such as reset password. Users stay informed of ticket status and can provide feedback whenever and wherever they are through the channel of your choice. Since a Level-0 tech should also unburden senior techs, you’ll see how Luma helps level-2 technicians improve their productivity by managing and assigning tickets, automatically following up with users, and enabling users to access and update ticket information without a human technician in the loop. Finally, see the no-coding tools available to create unique capabilities for your organization if the 200+ out of the box skills need to be extended. Learn how to overcome the 5 most common frustrations and efficiency impediments. ServiceAide’s CTO William Guinn will describe how artificial intelligence and a virtual support agent integrated into our Cloud Service Management™ products will aid you to overcome them, as well as how you can lower your ticket volume, resolution time, ticket processing costs, and increase customer satisfaction and IT/support job satisfaction. 25% of technology projects fail outright, 20-25% don’t show any ROI, and as much as 50% need massive reworking by the time they are finished. Join our open forum, and ask questions as we walk you through what it takes to have a successful a Ticketing Solution. Hear tips, tricks and horror stories from the best. Ransomware is hammering the Internet, and when a system is infected it is already too late for IT to help. IT cannot reverse the damage of most attacks, and a single compromised system is the gateway to an entire enterprise. After a brief discussion of what ransomware is, we will explore the people, processes, and technologies that are effectively securing the historically vulnerable parts of a company. What is the difference between an Asset and a Configuration Item? There is a lot of confusion as to what the difference is between an Asset and a Configuration Item (CI). When should a new object be an asset and when should it be a CI? In a lot of ways, they are alike, but there are some very important differences between them. Presented by ServiceAide a provider of Cloud Service Management, a SaaS ITSM solution focused on Managed Service Providers and IT organizations. Participate in our webinar, and we will show you how to implement a service catalog, how you will benefit from asset management and why your company needs service level agreements. Asset Discovery & Asset Management provides value to you and your customers by expeditiously understanding and resolving issues by linking incidents and assets. This valuable information makes it straightforward to track what assets are in use, need updating, are problematic, or are a security risk. A Service Catalog saves your technicians time by having service requests as a digital one click store front. End-users love and benefit from a single source for all their needs, a search mechanism allowing them to easily find what they need without frustration, and obtain immediate feedback and status updates. Service Level Agreements prioritize your activities to ensure compliance. Give the tickets a voice let them automatically escalate when they are nearing an SLA breach. SLAs create automatic metrics that are used for analysis and reporting to highlight recurring issues and drive continuous improvement. Please join us for a free interactive webinar to learn how Nampa School District achieved high standards for IT Service Management. Mr Peter Jurhs - Director of Information Services- will share his experience and knowledge during this 45 minutes Webinar. IT Service Management has been too complex for far too long. Join us for 45 minutes and see how the ServiceAide ITSM platform provides an easily customizable, code free solution for your Service Management needs - accessible in minutes! Micah Garside-White is Solutions Architect at ServiceAide, working on Service Management solutions for clients of every size, from multinational with 30,000 active users to start-ups. Join us for a 45 minute webinar and learn how Cloud Service Management from ServiceAide™ will help your organization provide better IT Service Management with powerful Mobile apps. Work from anywhere with the full effectiveness of the IT Service Management on any device. In this informative session we will demonstrate how agents can manage their queue to act on tickets and approve changes from anywhere using the Cloud Service Management mobile app that greatly improves mean time to resolution (MTTR) and overall agent efficiency, so your company can deliver faster, better, and smarter service. Secret 1 - Be like Amazon not like Pentagon! Trizetto leads in the Healthcare industry with a grow of 12% CAGR through 2020. TriZetto delivers world-class, healthcare IT solutions that enable healthcare organizations to work more efficiently and collaboratively to deliver better health. Serviceaide’s vision is to transform IT Service Management by applying breakthroughs in artificial intelligence, machine learning, and natural language processing to deflect tickets and automate user requests through conversations.